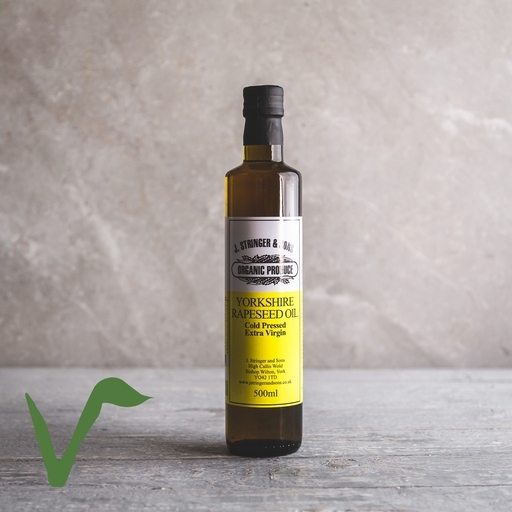 The only cold-pressed organic rapeseed oil made in Britain. Rapeseed oil is very versatile: it has a high burn point, so it’s ideal for frying and roasting. You can enjoy its delicate, grassy flavour on its own for dipping with bread, and it works well in salad dressings. Also good in place of butter in mashed potatoes, crumbles and Yorkshire puddings. Made by J. Stringer & Sons, who have been farming on the Yorkshire Wolds for more than 50 years. Use in the same way as other standard oils or fats used in the kitchen for frying, roasting, baking or dressing.